I never thought the husband will be able to pull off a surprise party for me because like what I've said before I always end up knowing it beforehand but this time I failed...My sister Rina is the one who initiated the surprise party actually and she was helped by friends and my husband of course.. 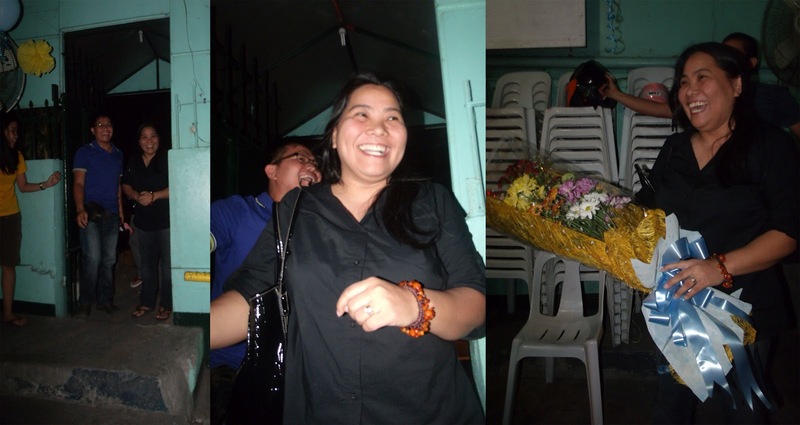 The surprised party happened the day after my birthday (february 09). On the eve of February 08, we also had a party for our Pastor (we have the same birthdate) but it's his 50th so we gave him a party not knowing that while I am busy planning for our Pastor's party, they were also had a party in mind for me :) So sweet! And my husband sang the song he composed for our wedding day :) it is so nice to hear that song again after such a long time. My husband may not bring home basketball trophies but nonetheless I am and will always be proud of him! My niece g& nephew gave me a special song too! Anyways, it took me long to post this because I don't know why I'm having a hard time attaching pictures, but I'll edit and put some more pictures when blogger or rather my net is not acting up anymore. What a wonderful surprise indeed. It's so nice to be loved and loved you are.